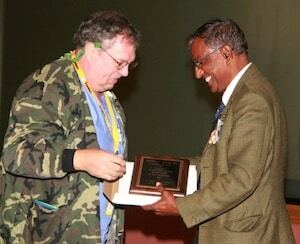 Steve Stache (left) receives his award from Dr. Vasu Melepati. Operating Room nurses help bring comfort to many people who will never know the names or faces of these dedicated health care professionals who play a significant role in helping to restore their health. Steve Stache, RN, an Operating Room nurse at Monongahela Valley Hospital, is one of those silent heroes. Mr. Stache was surprised to receive recognition from an MVH physician during the hospital’s National Nurses Week celebration breakfast on May 9 for his contributions to the health and well-being of people throughout the world. Mr. Stache accompanied Vasu N. Malepati, M.D., an otorhinolaryngologist (a physician who specializes in disorders of the ears, nose and throat) and Chito M. Crudo, M.D. a general surgeon, on a medical mission to the Philippines in 2011. Mr. Stache has been a nurse at Monongahela Valley Hospital for the past 23 years. He lives in Charleroi with his wife, Cheryl, who is a teacher. They are the parents of Steven and Cassie who are physicians living in the Philadelphia area. Previous articleAre Your Children Riding Safely in Your Car?